"..."Djembe!," which is hoping for a long run at the Apollo, also has the advantage of appealing to multiple generations at once. Around me Wednesday night, kids smaller than their drums had a blast, as did some very mature drummers. You're not forced to play and - here's another of the show's main assets - the class is large enough to mask any inadequacies in the drumming department from any particular student. So there's a certain impunity from embarrassment. Cool idea. You can just pretend to be hitting the right spot, or you can go hell for leather. Or you can do as you're told." "...Tonight, was a transformative musical experience at the Apollo theatre. As you walk in the theatre every seat comes with a West Africa drum called the Djembe, beckoning you to touch and play it, and let your inner soul come out. With the help of the Emcee played by Ben Hope, he teaches us the magic and how to handle and play the Djembe. The main performer and singer, who teaches us the sounds and songs from West Africa Rashada Dawan, a native of Chicago, who's voice is so pleasant to listen to, and teaches us the culture of the Djembe." "...While the musicians are superb in their rhythmic passion, it is Dawan�s glorious, genre-spanning voice, ebullient dancing, wonderfully sassy spirit and three costume changes (cheers for designer Montana Levi Blanco) from contemporary Afro-traditional, to shimmering black sheath, to colorful Calypso-modern blouse and pants, that easily steals the show and infuses it with a warm yet sassy peace-and-love vibe. Pure star quality." "...Djembe! is an energetic and joyous performance with the audience participating in musical theater and a journey through the history of rhythm." 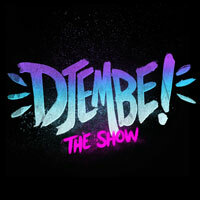 "...Djembe! is a Disney-like journey through the history of the West African drum, a kind of "Around the Drum in 80 Minutes" diorama, and that's OK. The intermission-less musical, in its US premiere at the Apollo Theater, is tailor-made for 'tweens and families eager to make some noise together." "...In this writer's opinion this might be a good show for children over the age of 10, but not too interesting for adults and especially those already familiar with this musical genre. The narrative of the show is written below the level of young adult fiction. It's especially a good fit for people who have no familiarity of the origins of this music. Nonetheless, it is a lively musical journey."